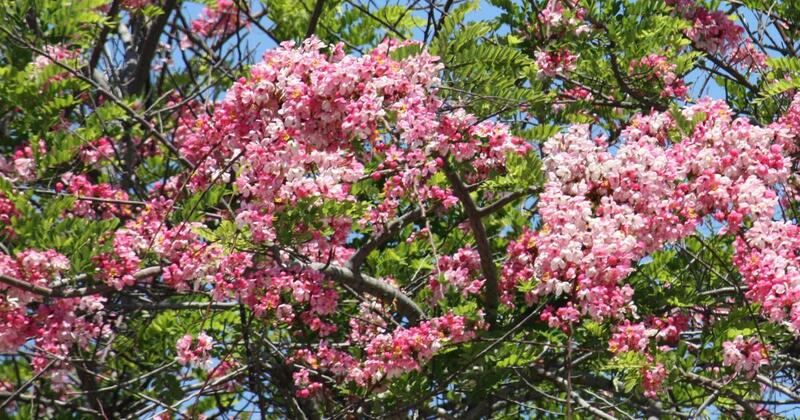 Trees like the Apple Blossom and Tabebuia not only look beautiful, but can also make your house cooler and quieter. My house is situated at the junction of two busy roads in Noida. When we first moved in, the windows opened out to a barren landscape, cars honked outside at all hours, and the sweep of headlights at night disturbed our sleep. A fruitless date palm was the only tree in the neighbourhood. I was determined to change this. I began planting trees in our yard, which at first elicited criticism from my family. They complained that the building was barely visible from the road, thanks to the growing leaf cover, and bird droppings swathed the cars parked in the open. But, as the summers grew longer and hotter, the objections died down. Now, more than a decade on, our house is referred to as “jungle ghar”. Now the shade is welcomed. A bleak landscape is not the view we now get from the first floor of the house – it changes with the seasons. Every morning we wake up to an avian orchestra. Hummingbirds, bulbuls, barbets and bee-eaters nest in our trees. Sparrows and squirrels quarrel over the bird feeders. The light streaming into the ground floor is cool and dappled green. During the summers, the temperature drops by several degrees inside the home, and much of the dust is blocked by the leaf barrier. Ever since pollution levels have become life-threatening in Delhi-National Capital Region, I have been asked by several homeowners and apartment blocks to suggest trees that do not have invasive root systems, grow quickly and have flowers that are either fragrant or beautiful. Some people look for trees that have straight trunks and a canopy at a height when ground level space is limited. Homeowners with west-facing facades are looking to cut the summer heat and afternoon sun. 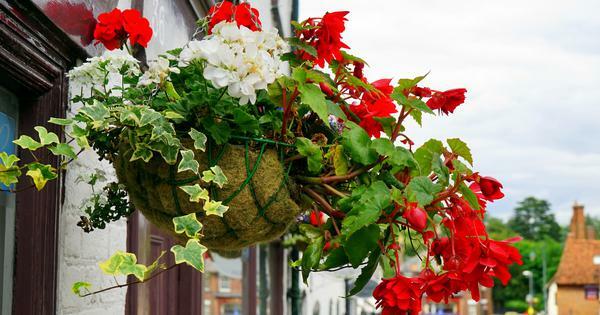 Others want to spend time in balconies surrounded with flowers at a particular time of the year. 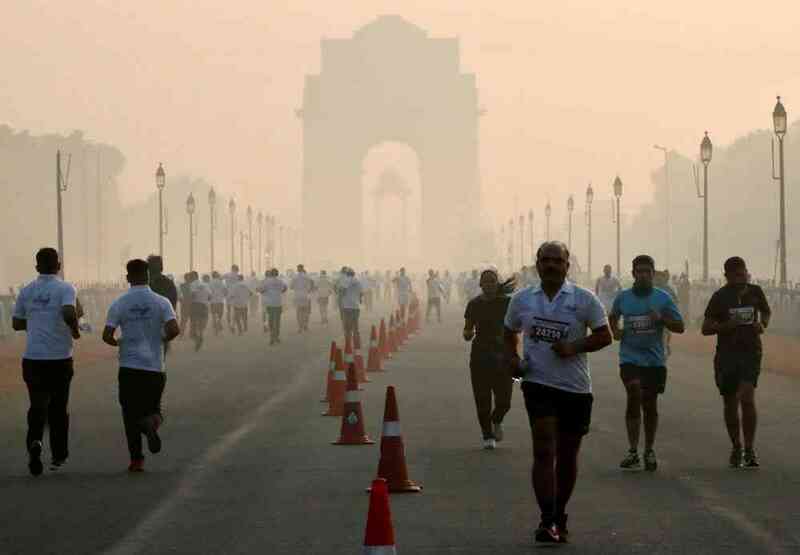 Smog in Delhi. Photo credit: Altaf Hussain/Reuters. In this article, I am going to list about a dozen trees that block out streetscapes and cut noise and dust. I am not going to be particularly fussy about native and non-native species: plants do travel and adapt, and we are not talking about the reforestation of a landscape, but about making space for one, preferably two, trees outside your window. They may require nurturing, but it is worth the effort. I am also not going to talk about beautiful but commonplace trees, such as laburnum, gulmohar, jacaranda, crepe myrtle, haar singar, bauhinia and frangipani. You can now buy trees online, which means you have access to a wide variety. I have been ordering from Exotic Flora in Andhra and their trees are packaged very well. All trees have transplanted properly and are thriving. The first four trees are a tribute of sorts to the erudite and passionate Khan Sahib of Jor Bagh, who passed away this September. I was a gardening novice when I visited him for tree suggestions, and spent pleasant moments poring over his books in an arbour filled with flowers. These are his suggestions, ideal for North Indian cities as well as Bengaluru and coastal metros. Photo credit: Sarangib/Pixabay [CC0 Creative Commons]. 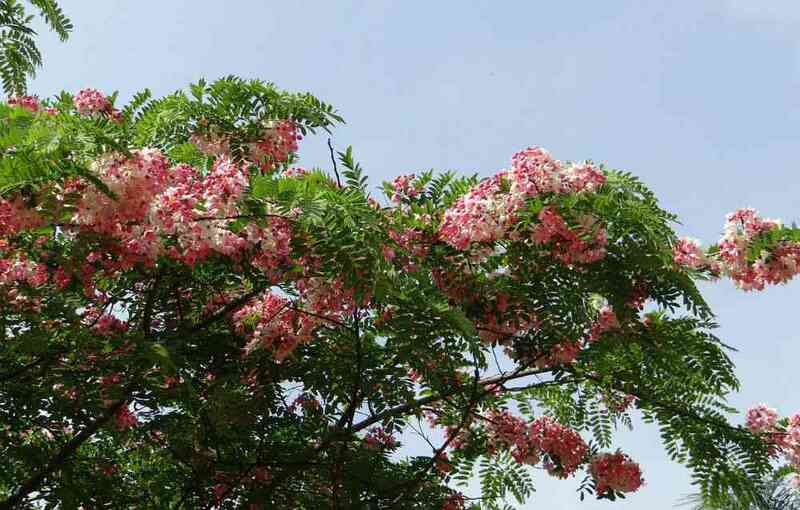 Also known as the apple-blossom tree, it is one of the most beautiful of the genus Cassia. 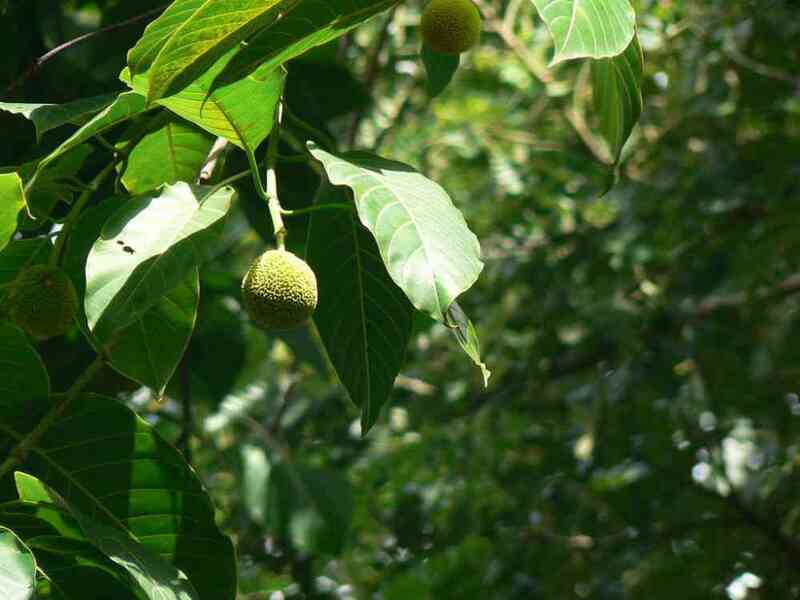 The deciduous tree, as the name suggests, originated in Java, and is now popular all over Southeast Asia. It ranges in height from 15 metres to 20 metres. The springtime inflorescence is delicate in shades of pink, and its beauty is reminiscent of a Chinese water colour. Its feathery, oval-shaped leaflets are mostly shed in winter, making it suitable for those who want to enjoy the winter sun. Well-drained soil is required. This was what Khan Sahib recommended when I asked for a tree that attracted birds and bees, had spectacular flowers around Diwali, provided shade in summer and was leafless in winter. I was also particular that it had to flower for over a month. Silk floss tree grows rapidly to a height of 50 feet, but as it suffers from branch drop, it does require regular pruning of the lower branches and a slightly more generous space to grow. Its large, hot-pink flowers with creamy throats attract hummingbirds and bee-eaters. I have trailed a spring flowering vine which flowers when the tree is leafless, so the tree is stunning for many months. The new leaves are a fresh vivid green – a joy to behold from afar. The soil needs enriching with farmyard manure and bone meal twice a year. An alba variety is also available. Photo credit: Dinesh Valke/Flickr [CC BY-SA 2.0]. My love for Bengali sweets led me to hunt for, and plant, this tree – a favourite of Lord Krishna, and one that features in many miniature and Madhubani paintings. The sweet in question was the syrupy kheer kadam, named so after the fruit of this tree. Appropriately, the tree bursts into flower around Janmashtami. A quick-growing tree of around 50 feet, it has pretty, deeply veined leaves. It attracts clouds of butterflies when in bloom, with its laddoo-sized, gold spherical blossoms studded with white stamens. A native tree, it needs no feeding or special attention. In fact, kadamba leaves make good compost. Another native tree worth considering is the Sacred Barna. It flowers in spring in North India and its cream and violet flowers look even more attractive due to the long stamens. Once a choice for avenues and public parks from Delhi to Karachi, the trees are a little difficult to locate now – Lodhi Gardens has a few. Moulmein Rosewood, with its lovely lavender blossoms, is another tree that is worth searching for. 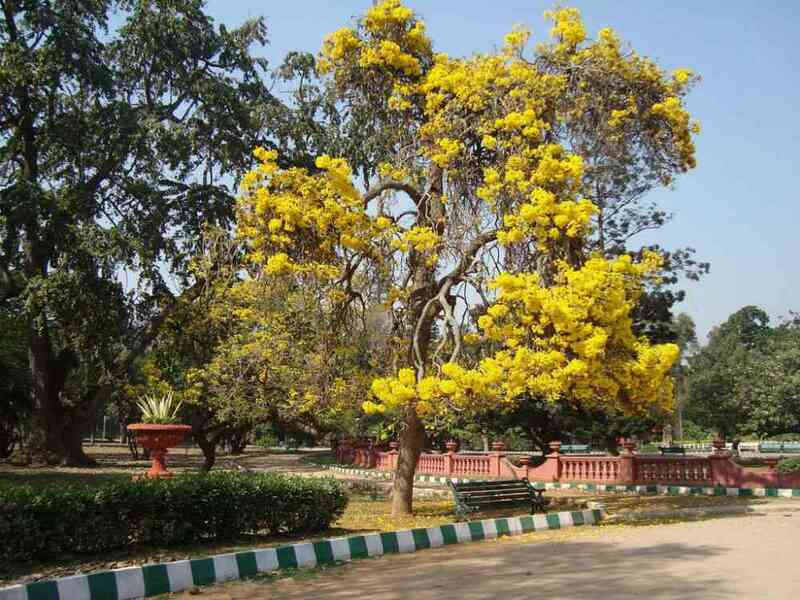 A tabebuia growing in Bengaluru's Lalbagh botanical garden. Photo credit: Hafiz Issadeen/Flickr [CC BY 2.0]. This drought- and salt-tolerant deciduous tree grows to about 25 feet to 30 feet in height. It has a distinctive grey-green foliage and vivid yellow, trumpet-shaped flower, making it a showstopper in spring. The tree could need staking to make it stand upright during the growing years. It is very easy to grow as compared to the pink rosea variant, which is also very striking. Photo credit: JM Garg/Wikimedia Commons [CC Attribution-Share Alike 4.0 International, 3.0 Unported, 2.5 Generic, 2.0 Generic and 1.0 Generic license]. My grandmother’s home used to have this tree, and after searching for one for several years, I finally found it online. As children, we used to dip the flower heads in soap solution and blow air through the long calyx to fill the lawn with iridescent bubbles. It is a fragrant night-flowering tree with lovely pendulous white flowers, which slightly resemble tuberoses. The leaves are serrated like those of a neem, hence its name. The flowers shed at night like the haar singaar and carpet the ground with stars. It is a tall tree and can grow up to 80 feet with a few branches, making it perfect for those who entertain on their balcony or terrace at night. It needs a sunny sheltered spot with moist soil in summer – it cannot withstand strong winds as it is a little brittle. On several occasions, I have brought the following trees from a South Goa nursery and tried growing them in Delhi, but the city’s weather has always thwarted my attempts. But please do consider them if you live on the coast or in Bengaluru. African Tulip Tree. Photo credit: Mokkie/Wikimedia Commons [CC Attribution-Share Alike 3.0 Unported license]. 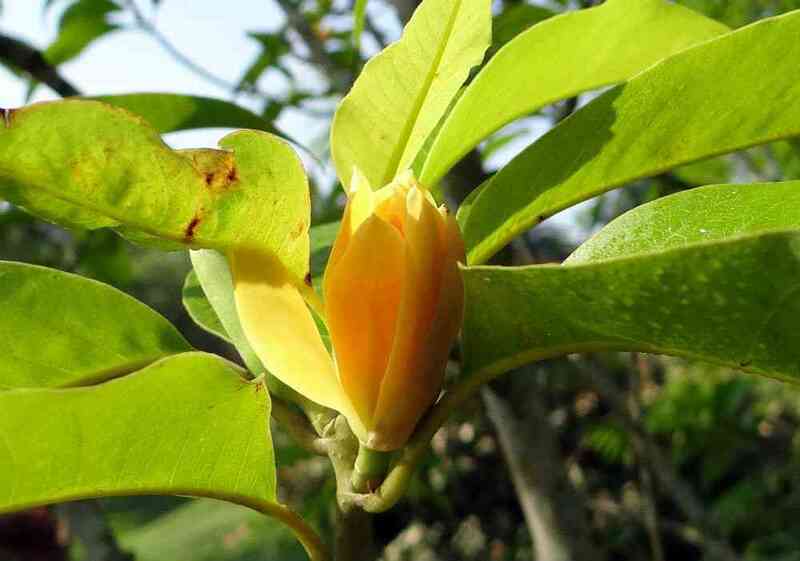 The African Tulip tree can survive in Delhi but prefers temperatures that are less extreme. It is a spectacular tree in Bengaluru: it reaches a height of around 75 feet and its flame-coloured, cup-shaped flowers have a pool of nectar at their base and attract birds and bees. The buds are bronze in colour, which heightens the beauty of the tree. A yellow-flowered relative, called the Nile Tulip tree, is almost as beautiful. Another orange-flowered tree that you could consider, if you don’t have much space, is the Cordia Sebestena. While on the subject of tulip trees, the Portia tree or Indian tulip tree belongs to another genus, the Thespesia Populnea or seaside mallow. It grows in coastal areas, and its chief appeal lies in the fact that its yellow flowers change colour to peach as they age. Son Champa. Photo credit: sarangib/Pixabay [CC 0]. A tree that beautifies the study of my friend in Pune is the son champa. The study window on the first floor opens onto branches which are laden with flowers from June to October, and the most heavenly fragrance perfumes her room. Gajras are woven with this flower. It can be floated in bowls of water, used in temples or in wedding celebrations. The rich orange or deep yellow variants are the most appealing, but pale cream ones are also available. The tree cannot withstand the Delhi summers. In ideal conditions, they can cross 100 feet in height. Photo credit: Halley Pacheco de Oliveira/Wikimedia Commons [CC Attribution-Share Alike 3.0 Unported license]. This tree is widely acknowledged as the queen of flowering trees. It is fairly expensive, a challenge to grow and hard to find. I have found listings in two nurseries in Maharashtra. I would suggest only experienced gardeners attempt to grow it. Other rare and beautiful trees that are worth going on a treasure hunt for are Castanospermum Australe, Brownea Grandiceps or Rose of Venezuela, Gustavia and Monodora Calabash nutmeg. If you are short of inspiration, do visit Cubbon Park in Bengaluru, the gardens around Rajghat in Delhi and the Agri Horticultural Park in Alipore in Kolkata. Many unusual and ornamental trees are waiting for you.